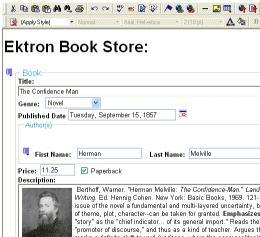 Ektron eWebEditPro+XML is a browser-based editor that empowers business users and developers to author both HTML and XML content in a smart Web forms-like word-processor, hiding the complexities of XML. Users can design "smart" XML Web forms with multiple validation options including full XML schema, validation, and XSLT transformation support. Supports data design, data creation, and data presentation modes, for end-to-end XML creation and use enabling the use of content-rich forms features such as tables, bullets, style sheets, image upload, and more. Includes integrated spell checking and international language support. Calculated fields deliver Excel-like calculation abilities (add, subtract, multiply, divide) within Web-based forms supports organizations' needs to create and deploy purchase orders, expense reports, financial statements, and many other forms that manipulate numeric values automating and streamlining business processes. Customizable elements include the toolbar, dialog boxes, right-mouse-click events, more. eWebEditPro+XML integrates with content management solutions (including Ektron CMS300), CRM and other Web applications, reporting systems for DSS/EIS and documentation repositories and more. It supports organizations' requirements to create information once and deliver it to multiple channels with ease: Publish it to multiple Web sites, print, wireless devices and CD-ROM. Developers can centrally control and manage items that appear in drop-down lists - creating them once so they can be reused in multiple smart forms. 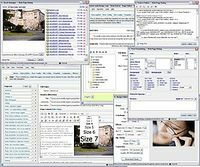 The editor enables dynamic interaction between the editor and the Web application. Its well-documented API supports sharing data among applications independent of platform. eWebEditPro+XML lets organizations leverage information that's highly flexible, searchable, adaptable, and powerful. eWebEditPro+XML reduces development cost and time to deliver critical business-user interfaces to business systems.